Transcript from an interview with Dr. John Nash at the 1st Meeting of Laureates in Economic Sciences in Lindau, Germany, September 1-4, 2004. Interviewer is freelance journalist Marika Griehsel. 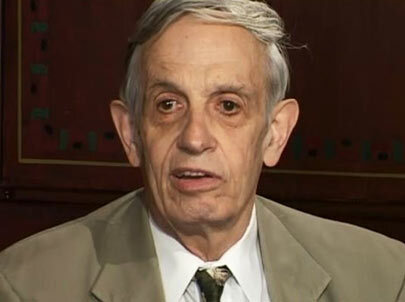 John Nash during the interview. Professor John Nash, very welcome to this interview. It’s an honour to have you with us. It has passed ten years since you received the Economics Prize. What impact has it had on your professional and maybe on your private life over the last ten years? 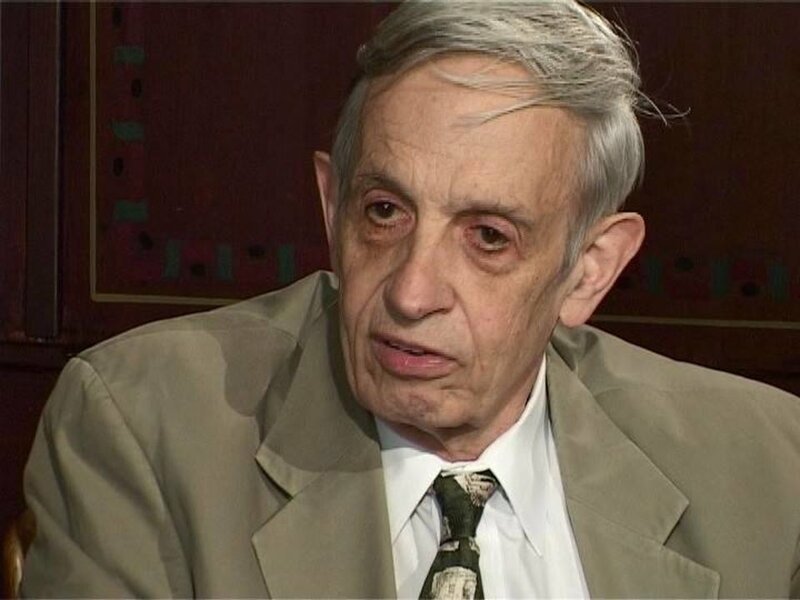 John Nash: Well, it’s almost ten years. It has had a tremendous impact on my life, more than on the life of most Prize winners because I was in an unusual situation. I was unemployed at the time. I was in good health, but I had reached the age of 66 and beginning to get social security, but I didn’t have much of that, I had many years of unemployment before me. And so I was in a position to be very much influenced by the recognition of my earlier work came about in this way. I had become widely known, but in a sense it wasn’t officially recognised. I was quoted very frequently in the literature of economics and mathematics, but it’s quite different to get official recognition. It transformed my life. Do you have any special memories from the time, -94, when you went to Stockholm to receive the Prize? Anything particular that you would like to share with us? John Nash: I have many memories, but I don’t know what I should say. It was very remarkable to be in Stockholm in December. It’s when the days are getting very short and I was there for St Lucia’s Day, which is where there’s a little premature celebration of returning light. It’s ten days early in fact. But you could see in the afternoon it began getting dark around three o’clock and so that was really a phenomenon that I had not observed before at lower latitudes. You said in your speech, I believe, or maybe it was later in your biography, that you were hoping, by having now the age of 66, that you would achieve much more professionally. Do you feel that you have had the opportunity and the time to do that, or have your time been mainly taken up by giving lectures or travelling around, being a celebrity? John Nash: Much of my time has been taken up in that way, but I have been making progress in the other sense. I haven’t completed so much. I have a paper published on ideal money, which I hope to follow up with another paper extending the ideas, and I really feel I’ve just discovered a … It’s hard to describe it … There has been a deterioration in the quality of money that’s observable in many areas, and it brings up questions. Like you could see how money is different all of a sudden in Italy when they had the lire and now they have the euro. So they, in a revolutionary way, have gone from bad money to good money comparatively. But what about the rest of the world? Even the dollar has some questions around today. John Nash: Oh yes, It’s not what it was. The dollar used to be a gold standard currency. And the dollar is really good in the last century, I mean in the 19th century. I find this very fascinating what you’re talking about. What are the reasons for this, would you say, that the quality of money has sort of changed? John Nash: Well, it’s complicated. I think we might get into too much deep water here … And I don’t want to compete with Professor Mundell in this media. I’m going to be listening to him and learning things when he lectures. John Nash: Oh yes. And I have other areas of research I’m about to publish and my work really relates to game theory, a project … and I have other areas of study. I don’t know how long I will live and how much I will be able to do, but at least I am active. I was thinking that, when you were a child … I have spoken to some of the Prize winners over the last couple of years, and many of them were not at all interested in the subject that they finally got very deep into. How was it for you? Were you very interested in maths, for example? Did you feel that you have a special gift for that? John Nash: I did have an appreciation of maths and science as a child, and even at elementary school I would like to do more in mathematics than the other students were doing in one way or another. So I did have that at an early stage. Like maybe almost comparable to Mozart in music. Of course he had a father who was a musician. Was that recognised at an early stage in your case, your special gift and your talent? John Nash: It’s recognised … my parents realised that I was mentally special and of course things developed. Where I lived the school system wasn’t really adapted for special students and so there wasn’t much to do except you go through that and then go on … from the town. Do you think it’s better now that there are maybe special schools for specially talented children so that one can really give them what they need? stage that doesn’t give them much. Could almost be seen as a waste of time for some? John Nash: Oh, it is. It’s like baby sitters … Sort of like you have kindergarten when it should be the elementary school. You were very young when you made your discovery that you were given the Prize for. What was the breakthrough for you when you were looking into that problem and, briefly, how did you realise what you were achieving at the time? John Nash: Well, there were special circumstances with regard to what’s called the Nash equilibrium, and that’s the main /- – -/ topic. I happened to be a graduate student in Princeton and von Neumann and Morgenstern were residents of Princeton, and they had written the book, Theory of Games and Economic Behavior, which in turn depended on some earlier work in France, Emile Borel, and then going back even to people like Pierre de Fermat and Pascal and who studied probabilities. And so I had the opportunity to describe something different from the procedure that von Neumann and Morgenstern, and I wrote it up, but I could use much of their ideas, their concept of strategies and utility, part of which in themselves they had been adopted from previous study by Borel, and so I could develop this thing which was first called ‘Equilibrium Points in N-person Games’ and then, ‘Non-Cooperative Games’ was my final thesis title. So it was very fortunate that I happened to be in that location. There was a seminar at the university that was concerned with work relating to the work of von Neumann and Morgenstern. So everything went together and I had also some other work relating to economics which linked in. This is what you call the bargaining problem, and that is also important, but it wasn’t cited for the Nobel Prize because I was linked with also with Harsanyi and Selten in the Prize and they were linked mostly with the equilibrium concept and everyone would think that Harsanyi also had done work in the bargaining cooperative games and Selten has done work in the experimental games. And he would talk on that here in this meeting. Did you realise at the time how big this discovery was? John Nash: I knew I had a good idea that was well worth publishing and it sort of expanded von Neumann and Morgenstern’s zero-sum game, which of course von Neumann himself had done originally. But it’s hard to know what would come of something, how the future would be, and of course as far as the Nobel Prize at that time there was nothing in economics that one couldn’t look forward to there. So that in -68 you started those, so that is entirely a matter of the fortunes of history. If you were to give advice to young students today, what fields should they look into if they are interested in economics? John Nash: With regard to the specific sub-fields of economics, I don’t know so well. I can observe the game theory is applied very much in economics. Generally, it would be wise to get into the mathematics as much as seems reasonable because the economists who use more mathematics are somehow more respected than those who use less. That’s the trend. I don’t think exactly like a professional economist. I think about economics and economic ideas, but somewhat like an outsider. Of course von Neumann was not an economist but Morgenstern was, and they teamed together on that book. Otherwise there are a lot of trends in economics. What seems fashionable now and the general opinion might be quite different after 20 years or so. Somebody studying a career they should be prepared for changes. I think they should learn things that are good foundations but don’t necessarily depend on a current fashion or what could be considered general opinion or popular opinion. You should maybe try to learn things that would be good for all time. Unquestionable scientific value. Are there any issues in the world today that you are concerned of? For example, if we look at the disparity between the first so called First World and Third World. If we look at the political situation and what comes with it, for example, the US budget deficit, and its reasons for that … Are there any of those issues that concerns you as a scientist and that you give extra thought? John Nash: You mentioned some different things here like the question of the First World, Third World and what happened to the Second World? The US budget, those are quite different topics. Certainly they are. There’s a broad span. John Nash: I think they require different doctors to deal with them. Is there anything that you are particularly concerned of or …? John Nash: Well, these are popular themes, but you find something that people are talking about and you may find that there are differing opinions. There’s the most widely held opinion, but there are maybe some other opinion that is more scientific or more subtle. It is easy to say that there are the rich and the poor and so something should be done. But in history there are always the rich and the poor. If the poor were not as poor we would still call them the poor. I mean whoever has less can be called the poor. You will always have the 10% that have less and the 10% that have the most. But maybe comparatively they’re not so bad. Man has existed for much longer than has this technology. I was thinking about these things when I saw India for the first time. I think it was last year in January 2003, when driving through the countryside of India I could see areas where presumably the amount of recognised income, personal income, would be very low. But this gave me the thought, comparatively one sort of peasant or level of Indian and another one might not feel so bad. These are not the beggars on the street, but people out in the country. If they had as much as someone else in that area, if they are not so poor compared to their neighbours, and if you look through history, humans have lived under different conditions, they had to live maybe very, very primitively a few thousand years ago, so much of this living of the modern humans is very, very recent. Man has existed for much longer than has this technology. I think from what you’re saying it’s really comparative how much you need and there is a certain idea maybe in the so called Western World that we need more than we actually do need. It’s a certain greed which has kind of taken resources from so called Third World countries. Does it lead to wishes of further wealth which is maybe …? John Nash: The more in the richer countries … if they wish to consume more, this is likely to provide some business for other parts of the world. They will have maybe some imports. I mean if countries like the USA and Sweden are to import more, then that is business for other parts of the world, and maybe some choice products. But what makes it hard for the other parts of the world if the countries again like USA or Sweden can manufacture all that they need in manufactured goods, and furthermore produce all they need agriculturally so they don’t need to import anything and they have things to export. That’s partly where we are today, isn’t it? John Nash: There is a political issue about these subsidies for agriculture that European countries, which could import agriculture products with subsidised local agriculture and maybe produce the products there, like Germany may be growing a lot of wheat which they make into brot, and it might be we wouldn’t need to grow any wheat, they could import it from Russia or somewhere. And then that would provide business by trade. May I come to a question that you must choose to answer whether you like or not? Because I think, as many people know, at least two films and one book has been written about your life. John Nash: You say two films? John Nash: Oh, a documentary is not really a movie or TV show. OK. And then a book which was the base for the film I believe, A Beautiful Mind. John Nash: There was a book and then there was the film, the Hollywood film. That’s right. It was partly concentrating on times which were very difficult in your life, or concentrating on that, and how do you feel about that version of your life that came across to the public and do you feel that there is a necessity for you to comment on that today? Or is it something that you left behind? John Nash: The movie is easier to comment on. The movie … Of course the family … We received some money for co-operating and authorising the movie. The movie is in part an interpretation of how a case of mental illness can go or could be the nature of a case and how it could evolve. Of course most typically what you call mental illness or what can be called schizophrenia has an unfavourable course in history, in the sense that the people never really recovered to be what you could call mentally well. They become like what are called consumers of mental health organisations. They are always taking some sort of a pill. They likely are not in hospital, they get out of hospitals but they live in a form of life that’s for people who are not really highly functionable, they’re not functioning, they’re not really in the economy as self supporting people. They’re not living a normal life from an economic point of view. So in my case there was certainly a recovery of sanity and more a possibility of doing normal activities, and so it was an interesting case. And I’m not a mental patient now, I don’t take any medicine, but I have a son who unfortunately uses medication and is in this process of taking drugs and seeing psychiatrists and this sort of thing. We don’t know what the course of that will be. But I was disturbed in this way for a very long period of time, like 25 years, and sort of starting around 30 so it was quite a portion of a life’s history. And the movie gives an insight into how this sort of thing can go. The movie actually, at the end of it, it suggests that the person in the movie is still taking some medicine, and taking a modern type of a drug after he had tried not to take any, he’d struggled with the issue of taking. So there is a difference there. The director in the movie didn’t want to suggest that people who are living in a state with controlled mental illness, that they should stop taking their medicine. It would be dangerous to suggest this. So it doesn’t correspond to me accurately. There had been many years since I haven’t had medicine, since 1970, that’s 35 years, well more than 30 years. John Nash: But even before that, most of the time I didn’t really take the medicine, so there are different types of … it’s not the same. But a film which was so widely seen and I was thinking that has it been important for you to be able to give your version of your life as well or is it something that you feel you can … because when somebody goes in and make a film about somebody’s life then you might need to say: That’s the film, but reality is a little bit different. John Nash: The film is artistic and it doesn’t describe accurately the nature of the delusional thinking that was my history, and it interprets … It has someone who sees imaginary persons, sees that different persons are actually present there /- – -/ and that is not, that’s not even typical in schizophrenia. But that interprets the idea of delusions. More typically a person may hear voices, they’re talking with spirits or something which are not there. This is the form of more typical delusions. But you can’t illustrate that in a movie very well. I mean if the movie shows someone who can be seen, then the person seeing the movie can better understand it. This can occur in mental illness but it’s the less typical form. It’s fascinating to talk to you and I’m really happy that you have spoken to us today. Is there any concerns … I was talking earlier about young students and somebody said to me that the teachers are those who open up doors, but that are the students who have to walk through them themselves. Did you have any teacher through your period at university which was particularly a role model to you? How has it been for you? John Nash: I certainly had some good teachers who were very helpful to me and influential. For example, in economics I only took one economics course and I was an undergraduate study in Pittsburgh at what is now called Carnegie Mellon, but by coincidence the person who taught the course, it was a course in international economics, and by coincidence this was someone who came from Austria. So there’s actually to consider Austrian economics is like a different school than typical American or British. So I was by coincidence influenced by an Austrian economist which may have been a very good influence. Thank you so much. I will enjoy very much to be able to listen through when the student discussions are going on as well here in Lindau. Thank you, professor.